EDITOR’S NOTE: This blog expresses the author’s viewpoint only. It does not represent the collective view of the city council or the City of College Station. In 1904, Edwin Jackson Kyle, Professor of Horticulture and an 1899 graduate of the A&M College of Texas, used land he had been given for agricultural research to establish a field for A&M football and baseball games. He spent $650 of his own money to purchase a grandstand from the Bryan fairgrounds and added wooden seats to accommodate 500 fans. In 1927, a new stadium was built at a cost of $345,000. Today’s renovation will cost $450 million and expand the seating to 102,000. There are Founder’s boxes that cost $10 million for a 20-year right to occupy these luxury boxes. As of June, all but two of these boxes had been sold. While five percent is obviously a small portion of the total amount, it does not consider the contribution that the cities of Bryan and College Station and Brazos County will make through increased police and fire protection, as well as through the maintenance of the infrastructure in roads and public works that will be required to accommodate an additional 20,000 fans on game day. Of course, there will be increases in receipt of sales taxes, which will help cover these costs, but it is not possible to increase the road capacities in and around Kyle Field to adequately accommodate these additional numbers. Thus, it will be necessary to utilize mass transit in ways that do not yet exist in College Station. The city of College Station has been doing an ongoing study of how to better manage the traffic on game days, but this can only provide a limited amount of relief and will have further costs involved in the investment of updated equipment. All of these factors have to been considered in any realistic view of the pros and cons of this redevelopment. I am a proud graduate of Texas A&M, having received my Ph.D. in 1983. Long before I attended A&M as a graduate student and came to appreciate the great educational value of this institution, I attended A&M football games at Kyle Field. I first came to Kyle Field in 1954 as a sophomore in high school and was overwhelmed by the atmosphere of this special place. I am aware of the many positive aspects of this redevelopment of Kyle Field and the need to bring it up to safety standards for those who are able to attend. However, I am also aware of some of the real challenges this presents for the citizens of this community, as well as for many former students and fans of Texas A&M football. We all need to be more aware of the positive, as well as the negative, factors that exist in college sports today. Obviously, it has become a big business with all of the power that implies. Yet, it is still part of an educational institution and part of the larger community with all of the opportunity and responsibility that implies. It is my hope that the discipline, fair play and good sportsmanship which the game of football at its best can represent, and “the spirit (that) can ne’er be told,” will not be lost in the loud roar for more seats, more money and more luxury boxes. Somehow, I think that Professor Edwin Jackson Kyle would agree with me. This entry was posted on June 14, 2013 by City of College Station. 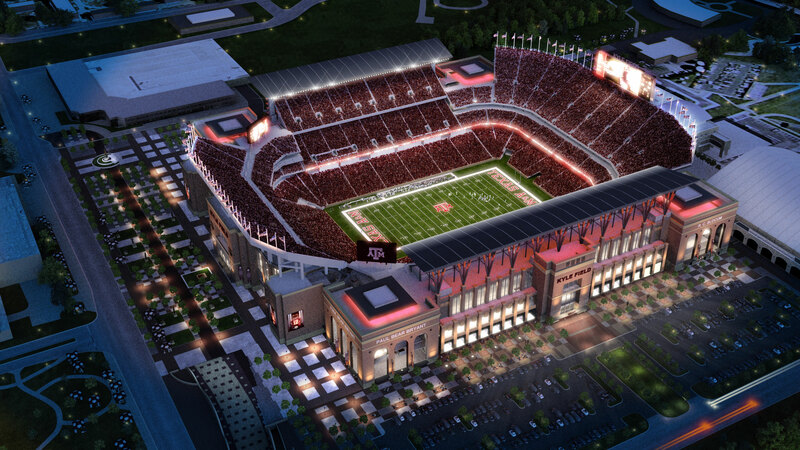 It was filed under Blanche Brick, City Council, Economic Development, Public Communications and was tagged with economic development, kyle field.